The “Corps of Discovery” expedition led by Meriwether Lewis and William Clark in the years 1804-1806 was instrumental in opening up western North America to settlement. After this defining exploration, fur companies further investigated westward routes. Financed by John J. Astor’s Pacific Fur Company, an 1812 expedition led by Robert Stuart began on the west coast at Fort Aster on the mouth of the Columbia River and forged eastward. A significant portion of the route Stuart traveled eventually became the Oregon Trail. 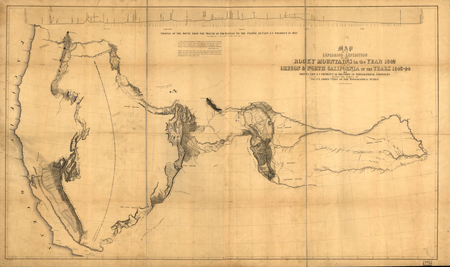 In 1838 Congress created the United States Corps of Topographical Engineers whose objectives included the discovery, surveying, and mapping of routes west. In 1842 Second Lieutenant John C. Frémont led an expedition from Missouri to the Rocky Mountains. During a second expedition in 1843-44, Frémont continued on to The Dalles, Oregon, then turned south and eventually back east across the Great Basin to return to Missouri. Frémont’s expedition reports were wildly popular. These reports and maps, combined with those of Charles Wilkes detailing the Columbia region from the Pacific Ocean to Walla-Walla, provided practical information about the geology, botany, and climate to migrants following the Oregon Trail west. Geography: Movement and migration of people and ideas affects the past, present, and future. What are the risks and rewards for people who migrate to new territories? 1. Review and read all primary sources and background information sources. 1. Display the map shown at the top of the page and analyze it as a class using the primary source analysis tool. What can you learn just from looking at the map? What more do you learn from the bibliographic record? 2. Divide the students into 7 groups and direct each group to analyze one section of the Topographical map of the road from Missouri to Oregon, commencing at the mouth of the Kansas in the Missouri River and ending at the mouth of the Walla-Wallah in the Columbia using the primary source analysis tool. If possible, print out the map sections and hang on the classroom wall. Find the average temperature for each day and plot the results. Find the total elevation change the explorers experienced. Find the approximate distance traveled by Frémont and his team each day. Compare those results with distances recorded in Frémont’s report. Compare average temperatures of locations recorded in 1843-44 with those from another year using the Farmers’ Almanac Weather History tool and find the average differences. 4. In pairs, instruct students to analyze the song sheet To the West! After, ask them to share what they learned about why people would migrate to the west. Have a music teacher or a student musician play the song To the West! 6. Ask students to share their findings and record shared as well as unique experiences and personal characteristics. If possible, capture findings with a digital camera and post to a class website, blog or shared document. 7. Divide students into four groups and assign each group a different article. Give each student in the group of copy of the article and have them read and analyze it together. Ask them to note what they learned about the Oregon Trail and the people who journeyed west and how that information compares with what they learned from the other primary sources. 8. Instruct students to use what they’ve learned from primary sources plus the background information sources below to create a poem, song or short story about journeying west on the Oregon Trail.